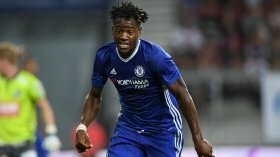 Chelsea are reportedly prepared to sanction Michy Batshuayi's sale on a permanent basis after setting an asking price of £40m for the striker. The Belgian has experienced an unsuccessful loan stint with Valencia and the Spanish side have already confirmed their decision to terminate the deal. Amidst this, Batshuayi has been linked with the likes of Everton and AS Monaco and The Telegraph claims that the Blues will favour the permanent departure of the former Marseille man. The Blues have currently set a £40m asking price for the Belgian marksman and they are hoping to garner as much cash as possible through his sale before the transfer deadline approaches. Both Everton and Monaco have been credited with an interest but the latter appear the more likelier to sign the Belgian, given the striker has previously worked with Thierry Henry in the national setup. Chelsea have witnessed issues in the frontline with both Olivier Giroud and Alvaro Morata struggling and reports indicate that they are prepared to sign Gonzalo Higuain from Juventus to solve the concern.